ABLE accounts can be created by anyone to support themselves or by a family to support a family member. There is no federal taxation on assets held in an ABLE account. The investments can accumulate, grow, and be distributed free from federal taxes. Contributions to the accounts are made after-tax basis that means they are not deductible. The investments grow tax free and are not taxed as long as they are used to pay qualified expenses. Withdrawals from an ABLE account can be withdrawn tax free if the funds are used for disability-related expenses. Expenses qualify as disability related if they are for the benefit of an individual with a disability and are related to the disability. Qualifying expenses include education; housing; transportation; employment support; health, prevention, and wellness costs; assistive technology and personal support services; and other IRS-approved expenses. Withdrawals for nonqualified expenses are subject to income tax on the portion of such distributions attributable to earnings from the account, plus a 10% penalty on that portion. Each disabled person is limited to one ABLE account and total annual contributions by all individuals to any one ABLE account can be made up to the gift tax exclusion amount ($14,000 in 2014 and 2015, which is adjusted annually for inflation). Aggregate contributions are subject to the State limit for education-related Section 529 accounts. 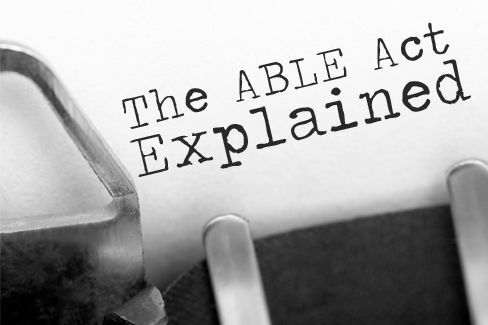 ABLE accounts can generally be rolled over only into another ABLE account for the same individual or into an ABLE account for a sibling who is also an eligible individual. Eligible individuals must be blind or disabled, and must have become so before turning 26, and must be entitled to benefits under the Supplemental Security Income (SSI) or Social Security Disability Insurance (SSDI) programs. An individual doesn't need to receive SSI or SSDI to open or maintain an ABLE account, nor does the ownership of an account confer eligibility for those programs. Alternatively, an individual can become eligible if a disability certificate for the individual is filed with IRS. ABLE accounts do not impact on Medicaid or SSI, although SSI payments are suspended while a beneficiary maintains excess resources in an ABLE account. In particular, the first $100,000 in ABLE account balances is exempted from being counted toward the SSI program's $2,000 individual resource limit. On the other hand, account distributions for housing expenses count as income for SSI purposes. Assuming the individual has no other assets, if the balance of an individual's ABLE account exceeds $102,000, the individual is suspended, but not terminated, from eligibility for SSI benefits but remains eligible for Medicaid. Upon the death of an eligible individual, any amounts remaining in the account (after Medicaid reimbursements) will go to the deceased's estate or to a designated beneficiary and will be subject to income tax on investment earnings, but not to a penalty. Contributions to an ABLE account by a parent or grandparent of a designated beneficiary are protected in bankruptcy. In order to be protected, ABLE account contributions must be made more than 365 days prior to the bankruptcy filing. The information via this article is not intended to create, and receipt does not constitute, an accountant-client relationship. Readers are advised not to act upon this information without seeking the service of a professional accountant. We appreciate the opportunity to let you know about the new law.